Customers and critics alike are singing the praises of the Morrison Hotel in Duiblin following a €6 million refurbishment. The hotel is now run under the DoubleTree by Hilton brand, the first hotel in Ireland to enjoy DoubleTree status. Marcon was involved in the manufacture and installation of the specialist joinery items in the reception area of the boutique hotel. 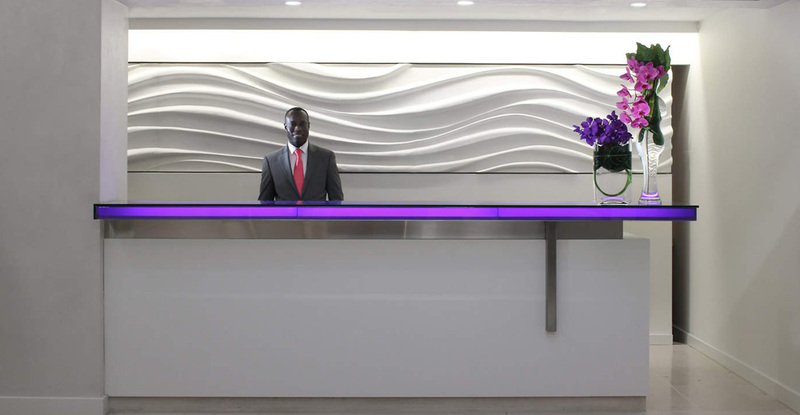 The feature reception desk had to possess a certain ‘wow’ factor in keeping with the lavish interior of the hotel. Made of a white corian base, incorporating brushed stainless steel, the new reception desk has a glass and corian top with an illuminated box. Our works also included a matching concierge desk and cantilever corian vanity units.